Kathleen McCartney, dean of the Harvard Graduate School of Education and a prolific writer in early childhood education, will give an address, “Investing in Education Reforms that Work,” at Whitworth University’s biannual President’s Leadership Forum. Sponsored by U.S. Bank, McCartney’s address will take place on Wednesday, April 24, at 4:30 p.m. at the Spokane Convention Center. Doors open at 4 p.m., and hors d’oeuvres will be served. A panel discussion will follow McCartney’s address. Sponsorship opportunities are available. RSVP by calling Nancy Kessler at (509) 777-3449 or online at www.whitworth.edu/leadershipforum. The Whitworth President's Leadership Forum series brings speakers to downtown Spokane who represent a broad range of voices, perspectives and ideas. Whitworth faculty and staff are confident that Christian worldviews and the ideas of Christian thinkers are sharpened by rigorous and open intellectual inquiry and by engagement with the broadest spectrum of thought. This confidence motivates Whitworth to lead the way in inviting speakers to Spokane who can help our community engage in critical and careful thinking, civil discourse and effective action. 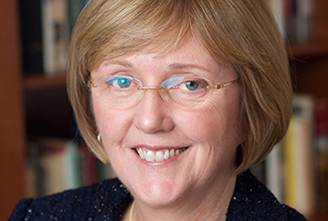 McCartney, who has served as the dean of the Harvard Graduate School of Education (HGES) since 2006, is also the school’s Gerald S. Lesser Professor in Early Childhood Development. She helped implement a strategic plan that has resulted in the creation of two new degree programs, a doctorate in education leadership (Ed.L.D. ), and a new interfaculty Ph.D. in education. Since McCartney has been the school’s dean, the HGES has seen a 25 percent growth in core faculty, a doubling of financial aid for Ed.M. students, a dramatic increase in fellowship support for doctoral students, and the establishment of a partner network with more than 30 school districts and nonprofit organizations. In 2011, The Boston Globe named McCartney one of the 30 most innovative people in Massachusetts. McCartney earned her Ph.D. in psychology from Yale University and has published more than 150 articles and chapters on childcare, early childhood education and poverty. She is a member of the NICHD Early Child Care Research Network, which summarized the results of its longitudinal study in Child Care and Child Development. She also co-edited Experience and Development, The Blackwell Handbook of Early Childhood Development, and Best Practices in Developmental Research Methods. In July, she will begin her new role as the 11th president of Smith College. The President’s Leadership Forum is led by Beck Taylor, who became the 18th president of Whitworth University in July 2010. Taylor says that his goal with the leadership forum is to bring timely and relevant experts to the Spokane community to discuss issues that are important for the region and those who lead it. Taylor came to Whitworth after serving as dean and professor of economics for the Brock School of Business at Samford University, in Birmingham, Ala., where he helped establish an entrepreneurship program that was recognized in 2010 as the nation’s top emerging program by the U.S. Association for Small Business & Entrepreneurship. Since arriving at Whitworth, Taylor has led the university in developing a 10-year strategic plan, Whitworth 2021: Courage at the Crossroads, which calls for expanding student opportunities for experiential learning, intercultural engagement, and post-graduate preparation, while continuing to elevate Whitworth's standing as one of the finest Christian liberal arts universities in the country. He also has opened new channels of communication with students, alumni and friends of the university and has strengthened connections with business, community and legislative leaders in the region. Whitworth’s last President’s Leadership Forum, held Oct. 16, featured Pulitzer Prize-winning political columnist George F. Will. Nancy Kessler, program assistant for donor relations and special events, Whitworth University, (509) 777-3449 or nkessler@whitworth.edu.